Kiehl's is promoting their Healthy Skin Trio, including Powerful Strength Line Reducing Concentrate, Ultra Light Daily UV Defense, and Midnight Recovery Concentrate. Purchase any one of them and get the other two in travel sizes. Valid thru Apr 30. La Prairie at Metro is offering mini caviar firming facial (45min) for $80, and fully redeemable with purchase of La Prairie products. Details below. 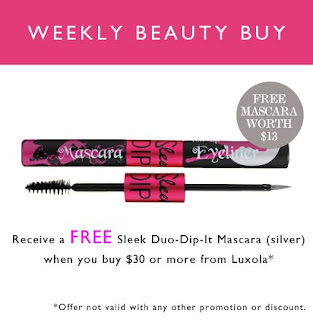 Luxola offers free Sleek Mascara & Eyeliner with any $30 purchase. Valid thru Apr 15 only. beauty.com offers free deluxe sample of Dr. Brandt Flaws No More R3P Cream with any $10 purchase. No code needed. Enter thru link. Beauty Collection offers free shipping on sun skin care products. No code needed. Limited time only. Beauty Sak offers $10 off any $45 purchase. Enter code 10APRIL at checkout. Valid thru Apr 15. Benefit offers free Pro Pore Makeup Case with any $65 purchase. Enter code PROCASE at checkout. Valid thru Apr 17. Bliss offers free shipping and a free four piece gift set with any $75 purchase. Free gift includes 10ml Triple Oxygen Instant Energizing Mask, 15ml Triple Oxygen+C Energizing Cream, and 50ml Triple Oxygen Instant Energizing Cleansing Foam and a Bliss blue tote. Enter code TO2MINIS at checkout. Valid thru Apr 30. Boscia offers free Clear Complexion Tonic worth $19 with any purchase of Purifying Cleansing Gel. Enter code FreeTonic at checkout. Valid thru Apr 16. Carol's Daughter offers 20% off the Macadamia Heat Styling Collection. Valid for Apr 10 only. Chantecaille offers free shipping and a free full size Brilliant Gloss in Charisma with any $175 purchase. No code needed. While supplies last. Clinique offers free shipping with any purchase. No code needed. Valid thru Apr 11. CosMedix offers free 2-day shipping with any purchase. Enter code APRIL2DAY at checkout. Valid thru Apr 10. Crabtree & Evelyn offers free shipping and 3-pc Spring Floral Set worth $55 with any $125 purchase. No code needed. Valid thru Apr 30. Estee Lauder offers 4 free samples with any purchase. No code needed. Valid thru Apr 11. Fresh offers free mini Sugar Lip Treatment Advanced Therapy with any $100 purchase. Enter code PURIFY at checkout. Valid thru Apr 12. Kiehl’s offers free shipping with any purchase. No code needed. Valid thru Apr 15. La Mer offers free shipping and a 30ml sample of the Cleansing Gel with any purchase. Enter code YOUTH at checkout. Valid thru Apr 15. La Prairie offers free 10ml Skin Caviar Liquid Lift worth $100 with any $500 purchase. Enter code LIQUIDLIFT12 at checkout. Valid thru May 1. LovelySkin offers free shipping and two free La Roche-Posay deluxe samples worth $16 with any selected items purchase. Click on the link to check the offer. Enter code ROSE12 at checkout. While supplies last. MAC Cosmetics offers free 2-day shipping with any purchase. No code needed. Valid thru Apr 11. Neiman Marcus is having another round of gift card event. Enter code APRILGC at checkout. Valid for Apr 10 only. Ojon offers 10 best sellers sample pack for $5 and ships free. Plus take $5 off next purchase of any full size item. Valid thru Apr 20. Perricone MD offers a free deluxe sample of No Foundation Foundation with purchase of new No Concealer Concealer at $45. Enter code FREENFF at checkout. Valid thru Apr 14. Philosophy offers free shipping and a free Fresh Start Skin Care Set with any $65 purchase. Set includes 30ml purity made simple foaming 3-in-1 cleansing gel, 7.5ml eyes wide open eye gel, and 60ml microdelivery exfoliating body wash. Enter code foryou2try at checkout. Valid thru Apr 13. Prescriptives offers free shipping and full size Concealer with any $25 purchase. Code as below. Valid for Apr 10 only. Proactiv offers free shipping with any purchase. No code needed. Valid thru Apr 15. Pur Minerals offers $12 off any 4-in-1 Pressed Mineral Makeup with purchase of the new Spring Bombshell Kit at $60 (worth $174.50). Enter code SAVE12NEW at checkout. Valid thru Apr 14. Saks is having their beauty events now. No tote offers this time, but there are 30+ gift with purchases from various brands. Sally Beauty offers free Paradise Tote with Purchase of $45+. Enter code 444367 at checkout. Valid thru Apr 30. Shiseido offers free shipping with any purchase. No code needed. Valid thru Apr 14. Shiseido offers a free deluxe sample of new Urban Environment Oil-Free UV Protector SPF 42 with purchase of any Ultimate Sun Protection product. No code needed. While supplies last. SkincareRx offers 13% off sitewide. Enter code 13YEARS at checkout. Valid thru Apr 12. Spalook offers 15% off any $65 purchase. Enter code ECO15 at checkout. Thymes offers free samples of all three Garden Alchemy Body Souffles and a delicate hand stamped bag with any purchase. No code needed. Valid thru Apr 16.
lookfantastic.com offers free Murad Vitalic Kit worth £42.26 with any £20 Murad purchase. While supplies last.